I love getting Children’s Museum membership as a gift. This would be an amazing gift as well! We love experience gift and always ask for people to be creative and think about those type of items if they really want to give us something. Especially family gifts! For our 15 month old’s first birthday a group of our friends went in and got us a family Indianapolis Zoo membership! Talk about a fun thing to do as a family when you don’t have any other plans. We took him during Zoo Boo and plan to go back in December for Christmas at the Zoo. We love goldfish!! My 2 year old is doing so well! 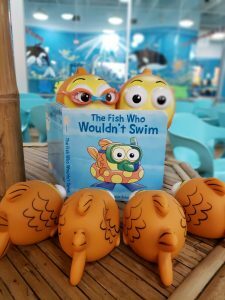 My kids received swim lessons at Goldfish for their birthdays last year, and they loved them! Our favorite gifts are always experiences! We are trying to start back up, and this package would be great to help with that. We love lessons at Goldfish! This is an awesome gift idea! We are current members at Fishers and would love to win this! We love goldfish! The instructors are so good with the kids! I sent my nephews to a college basketball game. They had a really good time. A friend of mine sent me and my partner once and that was super cool. I like the idea. Next PostNext Warm Up with Winter Fun with the Harlem Globetrotters!